The Livid Farm, aptly named for how it makes players feel after working there for hours on end, is a small activity / training location for Magic and Farming, alongside a little bit of Construction, Agility, and Crafting XP. The Livid Farm is the only way to unlock several useful spells in the Lunar Spellbook, and is one of the only methods of Farming training that do not require long lapses of real-world time. 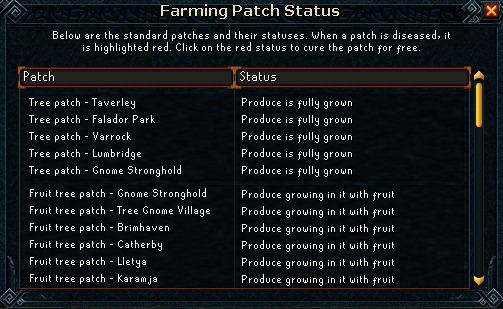 Livid Farm is decent for Farming training, and can be done alongside Farming runs for maximum Farming XP. 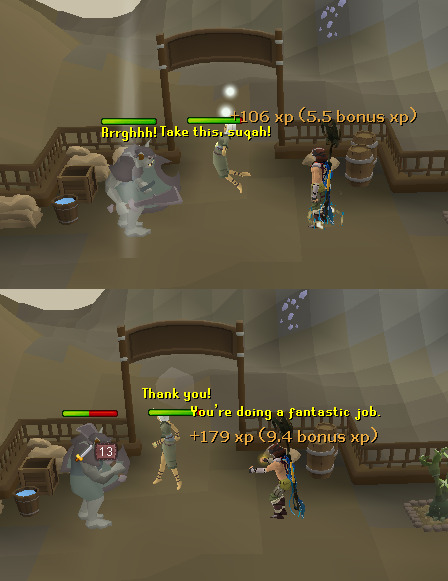 The best rewards from the Livid Farm include the spells Repair Rune Pouch, Remote Farm, Disruption Shield, Vengeance Group, and Teleport to Trollheim. Finally, full completion of the Livid Farm is a requirement for the basic Completionist cape. It is recommended for players who are aiming for the Completionist cape to do Livid Farm as soon as they reach the necessary requirements. 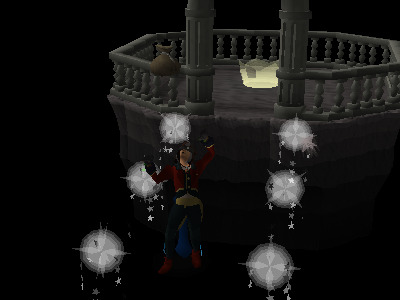 This is because large amounts of XP will be earned in the process of unlocking all the spells, which would be wasted if the player has already achieved level 99 in the relevant skills, and because unlike most skilling, the rate at which you can earn XP and Produce Points does not increase as you level up. *Not necessary with a mud staff. 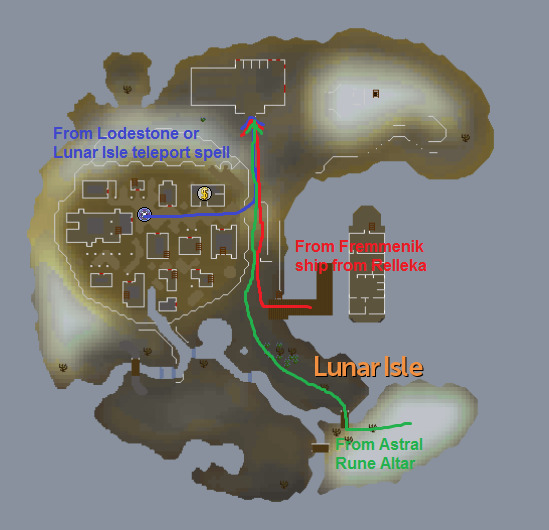 The fastest way to travel to the Livid Farm is by using the Lunar spell Teleport to Lunar Isle, then running northeast. Other options include the Lunar Isle Lodestone, the ship from Relleka (talk to Lokar), Wicked Hood teleport to the Astral rune altar, and Astral rune tablets from the Great Orb Project. Speak to Pauline to hear an introduction about the Livid Farm. You may then begin working on the farm. There are 5 different spells that can be used on the Livid Farm. The Lunar Spellbook must be activated to cast any of these spells. However, none of these require you to actually open the spellbook to cast - instead, they are cast by interacting with objects on the farm. Cure Plant is cast upon the diseased (black-coloured) livid. Attempting to do so will show an interface where you must identify the livid. Correctly do so and the spell will be cast. Choose incorrectly and the spell will not be cast (no runes used) and you must try again. See the Advanced Livid Farming section for tips on identifying livid. Fertile Soil is the simplest spell to use. Simply click on an empty patch (brown dirt, nothing growing in it) and it will be cast. You must first collect Lumber from the pile, then click it to cast Plank Make. This uses runes but gives no XP or Produce points. The XP and Produce points will be awarded once you use the planks to repair broken fences. Make sure to have 20 spaces in your inventory, 10 dedicated to Lumber and 10 to Livid plants. Wearing Constructor's armour will boost construction XP a bit, up to 6% for the full set. String Jewellery is cast on the Livid plants to bunch them together so you can deposit them into the cart. Similar to Plank Make, casting uses runes, but the XP and Produce points come from depositing them in the cart, not casting the spell. Wearing Artisan's armour will boost crafting XP a bit, up to 6% for the full set. Note that this outfit can only be obtained from Treasure Hunter, not by any ingame means. 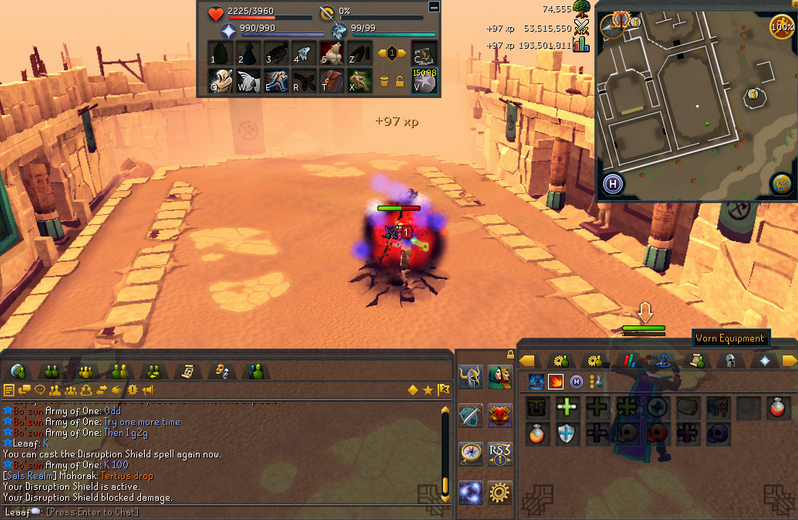 Energy Transfer was removed from the spellbook after EoC, but still exists in some form in Livid farm. Right Click Pauline and "Encourage" her to cast this spell. You must choose the most positive option out of the four choices. 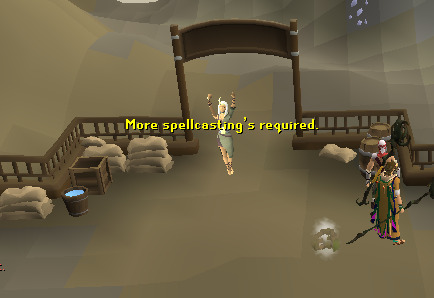 After EoC this spell no longer requires runes and no longer gives Magic XP. If your magic level is not high enough to cast a spell, you will still be able to cast it, but at the cost of receiving 0 Magic XP and half the usual amount of Produce points. You will still receive the full secondary skill XP though. 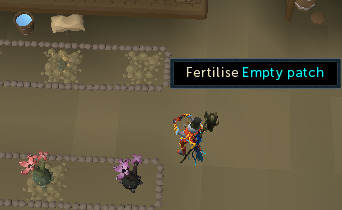 As an example, Casting Fertile soil usually gives 87 Magic XP, 91.8 Farming XP, and 20 Produce points. Trying to cast Fertile soil with under level 83 magic will give you 0 Magic xp, 91.8 Farming XP, and 10 Produce points. It is highly recommended to boost your magic level with magic potions, super magic potions, or extreme magic potions, if your magic level is lower than 91. Every minute, the Livid Farm progresses onto the next stage. Pauline will say something and white orbs will fly over the farm as it updates. It is easy to complete all the spells every 1 minute round. Doing so will give an average of 18960 Produce points per hour, which can be spent on rewards. 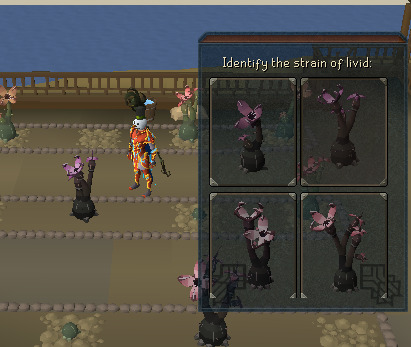 World 124 is the official world for Livid Farm, but note that there is no benefit to doing Livid Farm in a group instead of solo. 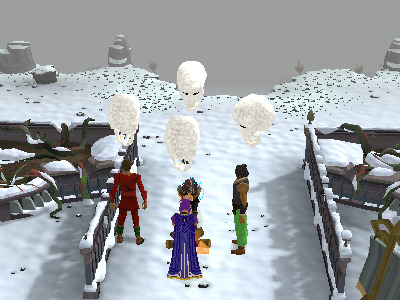 The farm is instanced for each individual player, so no one else can interact with your version of the Livid farm. Out of these 3, the only one you should bother with is the Suqah, and only because you have no other choice if you want to gain the XP and Produce points from Encouraging Pauline. If you see a Suqah, make sure to Encourage Pauline twice instead of once. The first time will give 100 Magic XP without having to choose a compliment to say to Pauline. 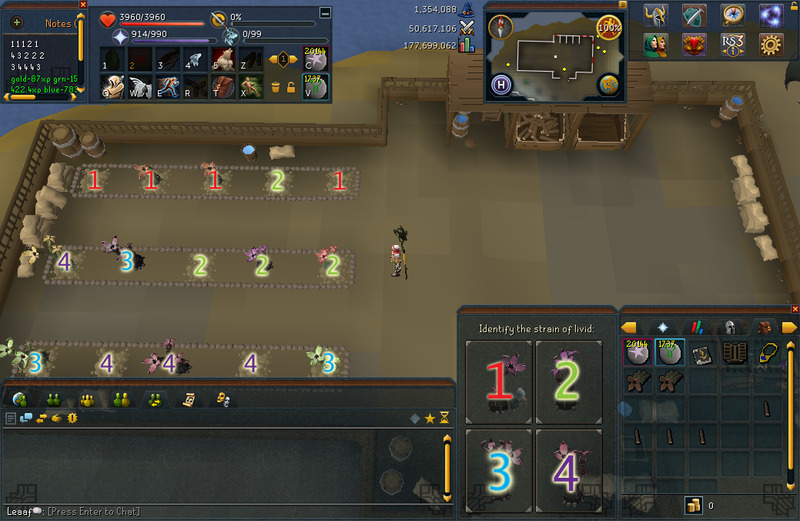 The second time will bring up the usual dialogue box and give Agility XP and Produce points. If you really want to know, doing a Distraction will give you XP for one cast of the spell involved and 0 Produce points, then refund you the runes used for that spell. The XP is on the order of 100 Magic XP, and not at all worth the effort. Worse, they will give you useless Mind, Cosmic, Death, Earth, and Water runes which will only clutter up your inventory. There are 11 unlockable spells from Livid farm, which are unlocked in a specific order. They require certain amounts of Produce points to unlock, but your Produce points will not be consumed until you buy the final spell, Borrowed Power. 850,000 total Produce points are required to unlock Borrowed Power and all the spells before it. This spell can be useful for getting to the Artisan's Workshop, the Mining Guild, the Falador Allotment and Herb patches (Note that the Explorer's ring from Lumbridge/Draynor medium tasks is much faster for this purpose) and Falador well (to spy Polar bears). This task is required for the Taskmaster emote, but not for the Fremmenik task rewards. This spell instantly repairs a rune pouch, and on top of that, reinforces it to last 5 times longer than usual. This spell used to one of the best Livid Farm rewards. However, ever since Runespan, barely anyone actually crafts runes anymore. 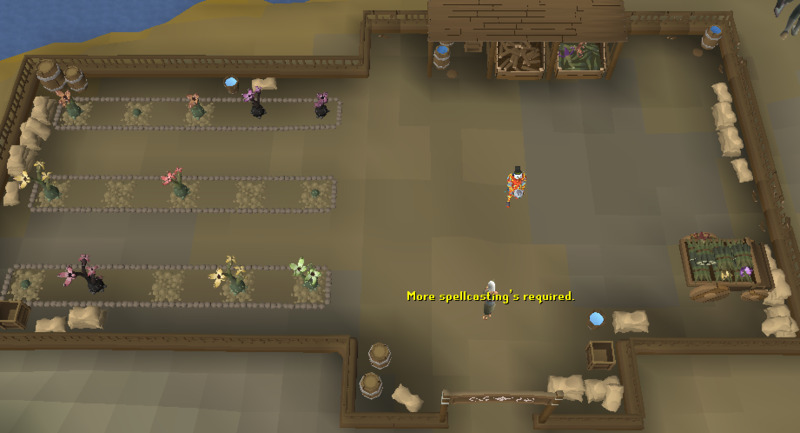 This spell can be used to get to the Ardougne herb patch if you do not have the Ardounge Elite tasks complete, and is the closest teleport to a Master Farmer for thieving. 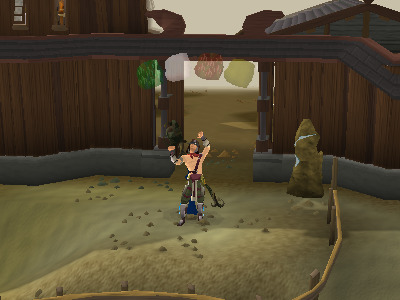 It is also slightly closer to a bank than the standard Ardougne teleport. This spell allows you to see the status of all farming patches, and instantly cure diseased plants. This spell is incredibly useful. As long as you remember to cast it at the right times, you will never need to worry about Farming patches dying again. This spell heals your familiar and slightly boosts its stats, dropping over time the same way boosted stats from drinking potions drop. It also extends the familiar's timer slightly. It can only be cast once per familiar though, making it relatively useless. This spell can be used as a profitable, albeit not very fast or easy, way to train Magic. Alternatively, it can be used when fighting chromatic dragons to free up inventory space by allowing you to craft the dragonhide drops into d'hide bodies. This spell blocks a single hit from an opposing player in PvP, reducing it down to 1 damage. Recharges every 30 seconds. ONLY works in PvP. This can be very useful when you anticipate your opponent using an ultimate ability. Since it only blocks one hit, it is not quite as effective against combo abilities. This spell gives the Vengeance status to the caster and anyone around them in a 7x7 square, if they have the "Accept Aid" option toggled on. Works on up to 50 people at once. 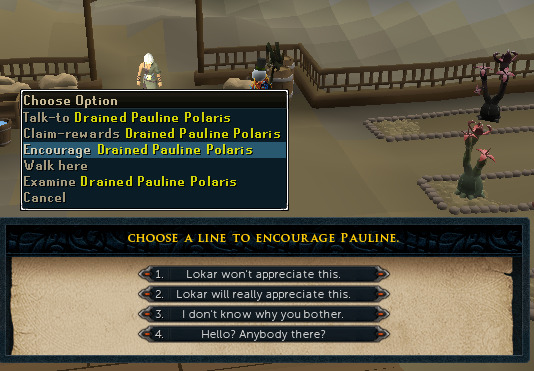 This can be useful in PvM or PvP with large teams. These two spells teleport you to the same place: The Herb Patch at Trollheim, right next to My Arm. The Group version affects players standing within 1 space of you if they have Accept Aid turned on and accept the teleport. After unlocking Teleport to Trollheim, the Lunar spellbook becomes the ideal spellbook to use for Herb Farming runs, with access to teleports to Trollheim, North Ardougne, and South Falador, as well as the utility spells Fertile Soil and Remote Farm. Note that with the corresponding Elite tasks complete, the Lumbridge ring and Ardougne cape are faster for getting to their respective herb patches than Teleport to North Ardougne and Teleport to South Falador. Borrowed Power allows you to cast certain spells from different spellbooks while the Lunar spellbook is activated. The spells that can be cast via Borrowed Power are: Wind / Water / Earth / Fire Wave, Slayer Dart, Vulnerability, Enfeeble, Entangle, Telekinetic Grab, High Level Alchemy, Bones to Peaches, and Teleport to House. This spell requires an Arcane capacitor necklace, obtainable by spending 18000 Produce points at Pauline. In addition, the necklace must be charged with runes for the desired spell to cast, and elemental staves may NOT be used to save runes. One necklace can only hold and use 1000 charges of a spell before being destroyed. Thus, the total cost for a spell cast using Borrowed Power is: Full rune cost of desired spell + 3 Astral runes + 18 Produce points. Due to the high cost, it is almost never worth it to cast Borrowed Power. After unlocking Borrowed Power, your Produce points will be reduced by 850,000 and you will be able to continue collecting Produce points to earn Wishes. Wishes are generally NOT worth getting. The only reason you would want to get them is if you plan on staying at the Livid farm for XP after having unlocked all the spells. The most notable Wishes are: Arcane capacitor necklace - 18,000 Produce points: required to cast Borrowed Power. New Patch - 18,000 Produce points: Creates a single use Allotment patch. More Planks - 18,000 Produce points: Small chance to receive extra noted planks when casting Plank Make, for 20 minutes. Reduce burned fish - 18,000 Produce points: Lower chance of burning fish for 30 minutes. Protect a patch - 37,000 Produce points: Protects a Tree or Fruit tree patch from disease 10 times. So you think you know how to Livid Farm? Think again. Do you know these tactics and secrets about this activity? The first thing you need to know about Livid farm is that the apparent randomness is an illusion. There is almost no randomness in this activity. These are the 5 states of Livid Farm. The farm will always cycle through these 5 states, in consecutive order. If you memorize this (or just have a page of notes in front of you), you will know exactly where you need to be during the next round, before the round even starts. This allows you to minimize the time you spend running around looking for where to go next, allowing you to finish each round faster and have more "idle" time. When Encouraging Pauline, the set of options you can choose from are random, but the position of the choices do not change. It may be helpful to only focus on the first word of each option and memorise what key to press based on that. For example, press 1 if you see "Come," press 3 if you see "You're," and so on. When casting Cure Plant, instead of identifying each Livid by appearance, look at their position to know which strain the Livid is. It is easy to memorise the matchups between position of the livid and which strain it is, but when you are getting started, it may be helpful to put number codes in your notes. Change the positions of your interfaces in order to see as much of the livid farm as possible. 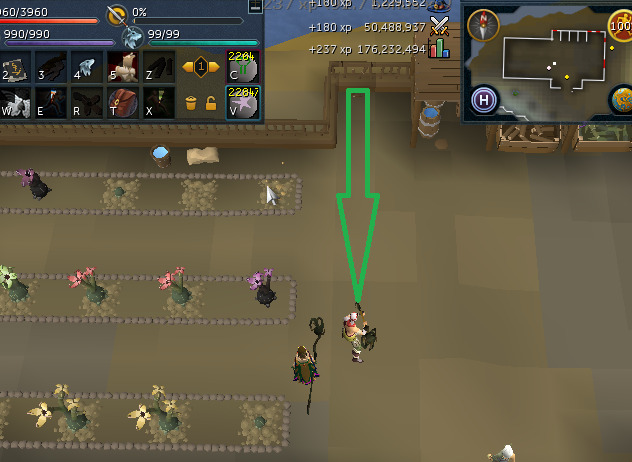 Note that you can separate the Cure Plant interface from your inventory (as shown in the above image), by simply dragging out the icon while your interface positions are not locked. 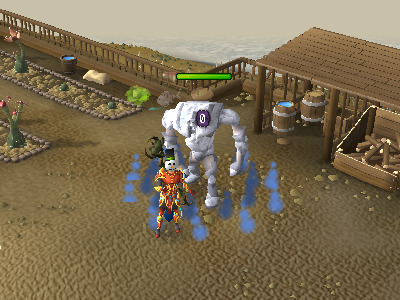 When doing an action in Runescape, there is often a delay before you can do another action. Cure Plant and Fertile Soil all take 3 game ticks (1.8 seconds) to complete before you can move or do anything else - no exceptions. However, there are some actions you can do on the Livid Farm where the animation is actually longer than the time required to finish the action. This is called Animation Lag, and the good thing is, you can get around this form of lag because it is only visual. This is done by interrupting the action with another action that does not have animation lag. In Livid Farm, Plank Make, fixing fences, and Encouraging Pauline all have a longer animation than how long the action actually takes. Casting String Jewellery to bundle 5 Livid has zero lag, and is a good way to cancel animation lag. If you do not have any Livid to bundle in your inventory, The abilities Anticipation and Freedom can be used to cancel animation lag. The easiest way to cancel animation lag from Encouraging Pauline is to immediately cast Fertile Soil. The ability Escape can be useful to cancel animation lag from fixing fences, but be aware that Escape takes 1.2 seconds before you can do another action, including moving. Using Escape is faster movement than running normally though. The best places to use the Escape ability are the northwest and northeast broken fences. Using Escape on the northwest fence puts you in perfect range of the Livid plants, allowing you to cast spells on any of them without further movement. Using Escape on the northeast fence puts you right next to the cart for depositing bundled Livid plants. Do not waste your "idle" time by standing around and doing nothing. The time lapse between Livid Farm rounds is annoying - the delays are too long and too frequent to just stand around waiting, but too short to leave and do anything else. 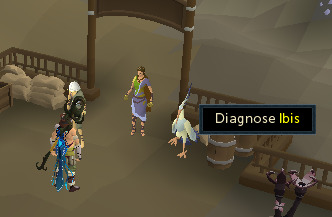 However, there is one skill that can be trained at almost any location: Fletching. You can bring supplies to make bolts or arrows, then fletch them while you wait for the next round. In fact, you may wish to skip doing Plank Make for more time to Fletch/skill, since Plank Make requires a lot of running around and gives relatively few Produce points. It is actually possible to teleport to Lunar bank, grab an inventory of logs, and run back to the Livid Farm before the Farm proceeds to the next round. You can then firemake those logs, or even firemake while running to the Farm. This is quite difficult and annoying to do though. Several other skills can also be trained, for example crafting Potion Flasks from robust glass. You can also do Livid Farm while waiting for a D&D like Fish Flingers or Big Chinchompa to start. 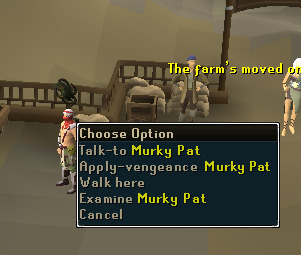 If you are doing any skill that requires withdrawing items from the bank, you should not do Plank Make on the Livid Farm. Even if you are not doing Fletching or anything else alongside Livid Farm, trying to complete each round as fast as possible can be a fun challenge, and also frees up more time to chat. *Water runes unneccesary with Mud Battlestaff or Mud Mystic Staff. You will earn 18960 Produce points per hour. It will take 44 hours and 50 minutes to unlock the final spell Borrowed Power. This will cost 47.3k Astral and 21.5k Nature runes. You will earn 1849k Magic XP, 1482k Farming XP, 294k Construction XP, 581k Crafting XP, and 274k Agility XP, not factoring in any bonus XP. 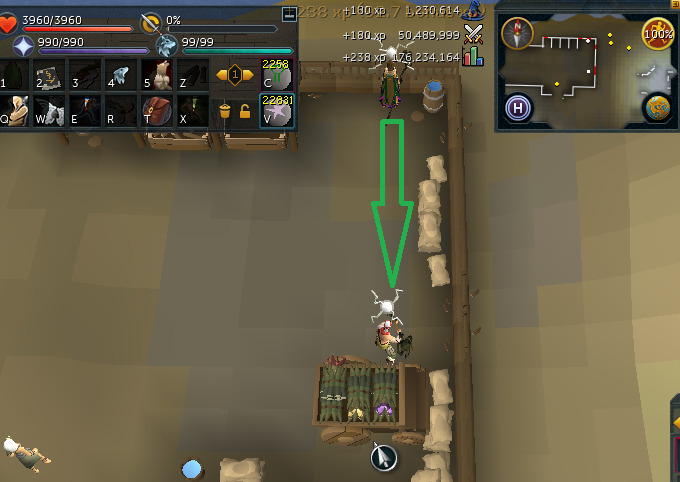 A bit less than 30 seconds per minute would be free for Fletching. This method is recommended if you want to complete the Livid Farm as quickly as possible. You will earn 16560 Produce points per hour. It will take 51 hours and 20 minutes to unlock the final spell Borrowed Power. This will cost 41.9k Astral and 18.5k Nature runes. You will earn 1563k Magic XP, 1696k Farming XP, 655k Crafting XP, and 314k Agility XP. Over 30 seconds per minute would be free for Fletching. This method is recommended if you don't mind sacrificing some speed to make the process easier and less click intensive, or if you want extra time to do Fletching. You will earn 7200 Produce points per hour. It will take 118 hours to unlock the final spell Borrowed Power. r. This will cost 85.0k Astral and 42.5k Nature runes. You will earn 3123k Magic XP, and 3902k Farming XP. This method is recommended only if you want as much Farming XP as possible and don't mind spending more. You will earn 9360 Produce points per hour. It will take 90 hours and 50 minutes to unlock the final spell Borrowed Power. This will cost 8.7k Astral runes. You will earn 362k Magic XP, 1177k Crafting XP, and 555k Agility XP. Almost all of your time would be free for Fletching - about 50-55 seconds per minute. This method is recommended if your main goal is to gain a massive amount of Fletching XP, and want to get Livid Farm completed on the side.